That's week one of Squaduary down and how am I doing? Well, ok.....sort of. I've managed to get the miniatures built, including some minor conversions, and I've undercoated the squad. I've also made a very small start with the painting as you can see in the photos below. So grey, so incredibly grey. You might not be able to tell from the photos but they are undercoated, I swear! It's just that I am taking a departure from my usual process and using a pale grey undercoat rather than good old Chaos black. The main reason for this is because these models have a lot of exposed flesh; which should be easier to paint over a light coloured undercoat. I have always struggled with flesh tones over black and found that they need plenty of thin coats to ensure good coverage. Lovely miniatures, it's a shame they're not painted. For those that missed out, Squaduary is an event run by Rory over at Stepping Between Games. The goal is to paint a squad of miniatures during February and update your progress regularly to help motivate all the participants. My pledge is to build and paint a squad of three Kataphron Destroyers for my Adeptus Mechanicus forces. 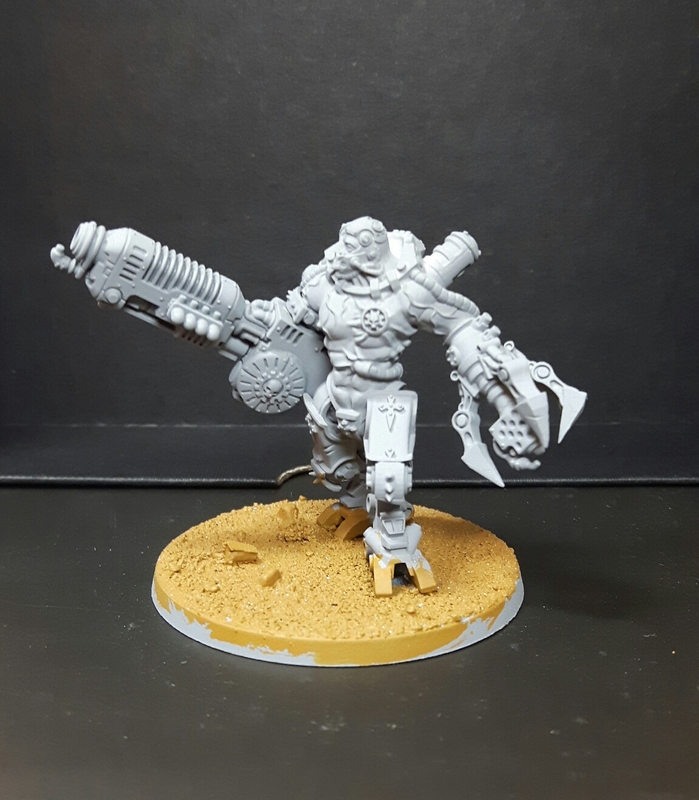 For those who are familiar with the Mechanicus model range, you will have noticed that the models I'm using are not your usual Kataphron battle servitors. These miniatures are produced by Wargame Exclusive and provide a nice change from the tracked versions produced by Games Workshop. I have altered the models slightly as I wanted to change the weapon loadout of the squad. 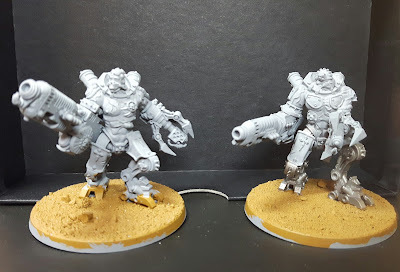 Wargame Exclusive provides two models armed with Heavy Grav Cannons and a single model armed with a Plasma Culverin. 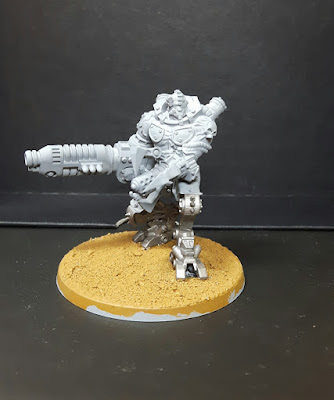 I really wanted my entire unit to be armed with Plasma Culverins, so, I removed the Grav Cannons and replaced them with GW Plasma Culverins that I had left over from my Kataphron Breachers. Scale wise, the GW cannons are slightly larger than the Wargame Exclusive, but not so much that it spoils the models. The slightly tricky part was that the GW weapons are designed to be side mounted onto the shoulder, whereas the Wargame Exclusive cannons are all mounted at the elbow. This required a raid of the bits box to find some suitable parts with which to cover the intended connection point. Fortunately I have a good supply of Mechanicus spares and managed to fill in quite well. I have also changed the phosphor blasters for cognis flamers. 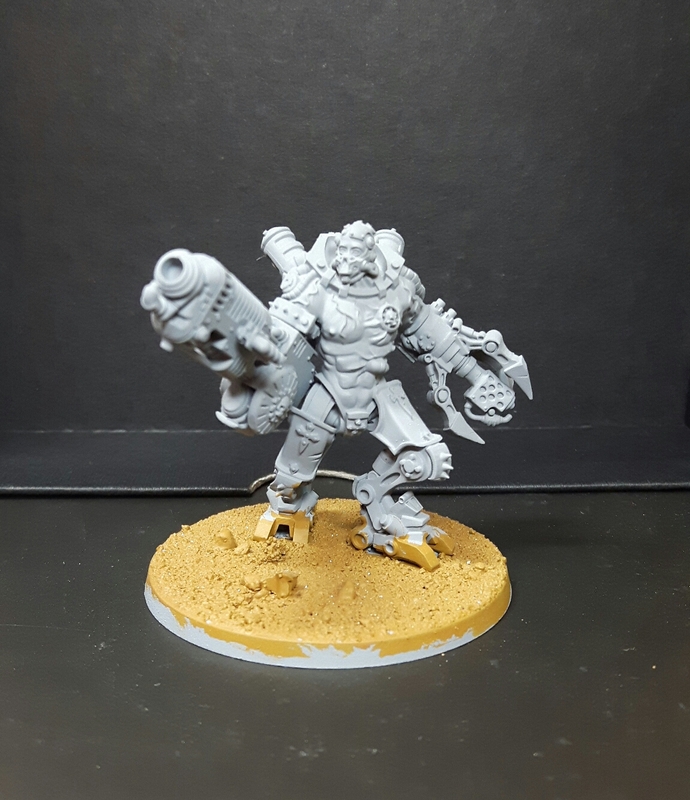 This was a pretty simple swap as I just shortened the barrels and added the nozzle from a cognis flamer. It did require some creative repositioning of the large claws that each model possesses; but I'm pleased with the way they turned out overall. As for the models themselves; the quality of the resin and the detail pick up is excellent. There were very few casting flaws and no warping was present across the squad. I did have some trouble gluing the parts together, however this was easily remedied with a little patience and the occasional pin (needed for some of the weapon swaps). So that's week one over, here's hoping that week two will bring a bit more colour to the squad. If you missed it, you can check out my initial Squaduary pledge here. Looking good so far. You really can't tell that they're converted. The resin looks great too! It's good stuff. One of these days I will put up that resin comparison post we talked about. Great stuff, some really nice conversion. You can hardly tell it didn't come with that gun as the aesthetic works so well. Cheers Michael! Seems funny to think that this time last year you were only just starting with your Deathwatch. I'll get them done Cylde. We're only one week in after all! Good progress and they really are solid minis, can't wait to see them painted. Cheers Rory! A few minutes every day soon adds up to a painted squad. At least that's what I keep telling myself!